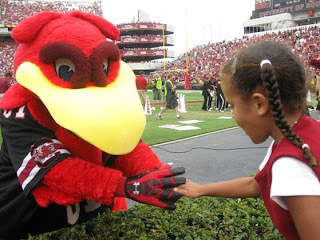 I may have been a little tough on the gamecocks in my previous post - maybe - maybe not, but I am starting to think that we might get our 7-win season afterall. 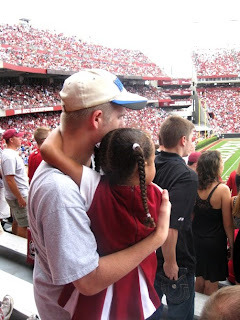 Then-25th-ranked (now 22nd) USC took on the University of Kentucky Saturday at the Williams Brice Stadium and I got to see the whole thing. Errr, not quite the whole whole thing. Patti, Eva and I left with 10 minutes remaining in the game and... well... it turned out to be the most exciting 10 minutes. Who knew? But we hate crowds, hate smashing into other people, so we got out while the getting was good and sat in the shade of the TylerMobile in our former tailgating spot, seen here behind Marj's head. 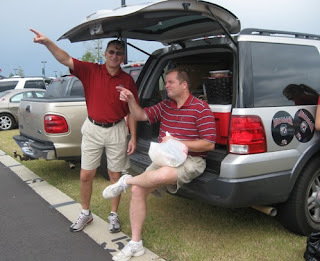 I caught Johnny and Tom tailgating, quite literally. What was interesting was their conversation. They were discussing the distance to the stadium and which driver they'd use to hit a golf ball there. The game? "Stephen Garcia threw for three touchdowns and ran for another and stopped a potential tying two-point conversion in the fourth quarter to beat Kentucky 28-26, keeping coach Steve Spurrier a perfect 17-0 against the Wildcats. 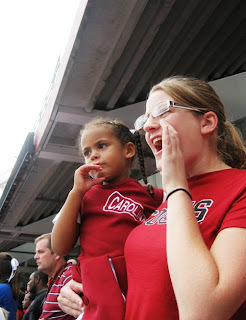 The Gamecocks (5-1, 2-1 SEC) won their 10th straight over Kentucky (2-3, 0-3)." 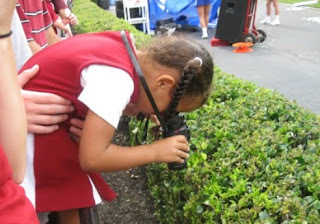 And Eva caught most of it in her binoculars. ...except when she got sidetracked looking at a bug. "South Carolina true freshman receiver Alshon Jeffery burned the Cats for seven catches, 138 yards and three TDs. Jeffery originally committed to Southern Cal (the other USC) and was recruited by Kentucky before signing with SC." I think Patti was yelling, "Yeah. And Alshon's high school coach is my dad's best friend!" So, yeah, y'know the third degree of separation and all that, we almost, like, know him. 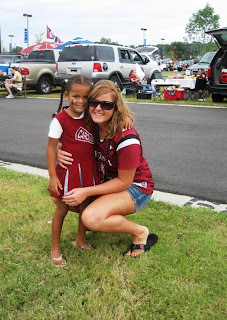 "The biggest play for Garcia may have come on third-and-4 with South Carolina needing to keep control. After looking to pass, Garcia ran for the first-down marker and leaped cornerback Cartier Rice for a 5-yard gain. The Gamecocks ran the clock out after that. Dude. He leaps players in single bounds. Most triumphant! Time to start thinking about next week: Alabama. 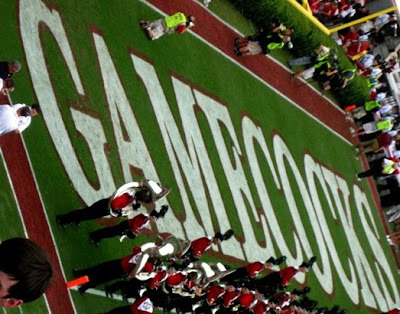 "South Carolina (5-1, 2-1 SEC) will enter the game ranked No. 22 in the latest Associated Press and USA Today/Coaches' polls, while Alabama (6-0, 3-0) is the nation's #3 teamin one poll and #2 in the other.The SC v Bama game is set for 7:45pm on ESPN.The Crimson Tide lead the all-time series, 11-2, but the Gamecocks have won 2 of the last 3 meetings between the two schools. Can it be done again?" 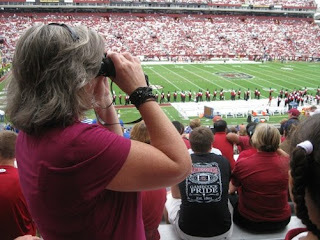 We will travel to Tuscaloosa, Alabama (does Cocky go to the away games?) to face the Crimson Tide on Saturday in an ESPN 7:45 p.m. national broadcast. Alabama (6-0, 3-0 SEC) is ranked second in the country by the AP. 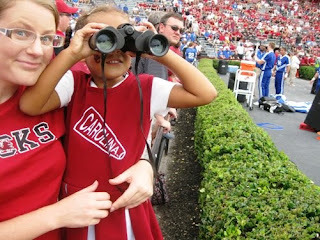 And, yes, I may have borrowed the binoculars once or twice to sneak a peek at her. Just, y'know, every now and then.